Hot Stone Massage is a form of bodywork that uses specialized basalt stones to provide heat and pressure in conjunction with hand massage. Basalt is a strong, smooth volcanic rock that contains iron and magnesium, which allows it to absorb heat. It's ordinarily found on ocean floors and lava flows. The stones are all different sizes and weights, from large to small, with small stones used on the face and feet and larger rocks used as tools by the therapist to work muscles in different areas of the body. Placing and kneading hot stones over muscles helps increase an area's circulation and blood flow to stimulate healing to painful or damaged muscles. 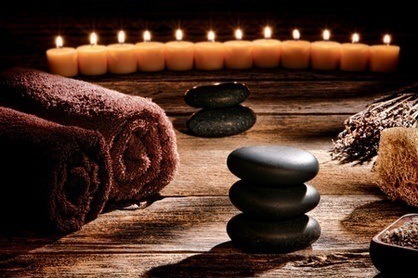 The deep tissue massage and heat of the stones also aid in the ability to move toxins and waste through the body. Massage also promotes relaxation, eases stress and anxiety, as well as alleviates muscle aches and back pain. One study, published in the June 2003 issue of "Annals of Internal Medicine," reviewed evidence from past trials that showed massage was effective for chronic back pain. Multiple practitioner's here at Unlocking The Body perform Hot Stone Massage. For more information about Hot Stone, read the FAQ’s below, or email the office to schedule with one of our Therapists. Most people request 60-minute sessions, although 90 minutes is the preferred length of session. This will allow you to receive a balance of deep tissue massage and also massage with the basalt stones for the heat benefits. The massage therapist often begins by applying oil to the body, which allows the hot stones to glide smoothly along the muscles. You are lying face down, and the massage therapist often then uses the hot stones to massage the back. After the hot stones have relaxed the muscles, the massage therapist may put down the stones and use his or her hands to directly massage the skin. The hot stones may then be placed back on to the body and left for a short period of time. First, a history is usually taken and the client’s condition is reviewed by the Pracititoner. The client stays fully clothed and usually lies on a treatment table. The Pracitioner then evaluates the client by placing their hands on various points on the body to locate the areas of restrictions. Once the specific areas are located the Pracitioner will begin working on one of the places of greatest restriction. During the session, the Pracitioner may work exclusively in this one area or move around the body as required to release and ease the competing tensions and restrictions within the body. How does it feel, should I feel anything? During the session clients may feel nothing except the therapist’s hands on their body, or they may feel like things are moving inside their body. They may also feel tingling, pains arising in different parts of their body that quickly disappear, heat, pulls within the body, or pulses. Following the session some clients feel a deep sense of relaxation while others may find immediate relief of pain. Others may at times feel nothing or an increase of pain for a period of time up to 24-48 hours, after which a relief of pain or discomfort improves significantly. How hot are the stones? The stones are heated in water that is kept at 120 degrees. The stones are hot enough to be comforting and soothing to the skin, the ligaments, the muscles, organs, as well as every cell in your body. How do hot stones help us heal? The minerals and healing properties contained in the hot stones promote an exceptional energy that helps relax the body, mind and spirit and promote the release of toxins preventing a healthy balance in the body. You are left with a feeling of complete relaxation, are stress free and ready to face the world with a new and positive outlook. How should I feel after a Hot Stone Massage? Just as individual experiences can differ, so can the results. Most people feel muscle tension decrease and are in a relaxed state. Others may experience an increase in energy. Reduction of pain or an increase in function may occur immediately after the session or it may develop gradually over the next few days. Joints may feel less stiff due to the deep penetrating heat, and you may have more range of motion.